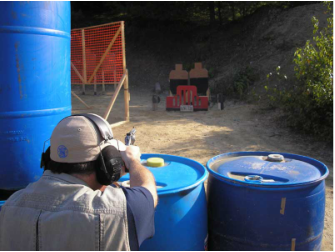 According to the NRA, action pistol shooting is an action type course of fire which combines speed and accuracy with shooting at multiple targets. There are four official target and 16 recognized courses of fire. There is no need for specialized equipment, but a safe and reliable gun or revolver and a secure holster are required. In addition, extra ammunition, magazines, speed loaders, and accessories are needed for this fast paced type of shooting. as well as non-members during the official scheduled events.